Alice has been involved in the Martial Arts for many years. Born in Mainland China, she was seconded to the Chinese Cultural Institute in Guangzhou at an early age to study Wushu (Kung fu). Winning many tournaments in China, she moved to Canada in 1981 with her family. 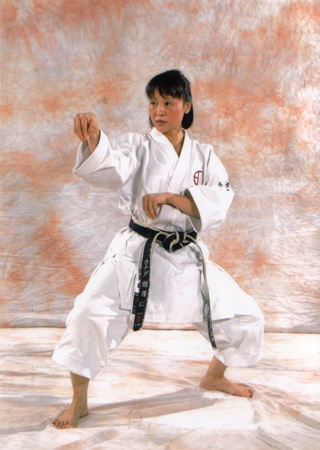 She met William Chung Shihan in Vancouver, B.C., and began competing in tournaments throughout North America. Alice was a sensation in the Karate circuit and was rated one of the top competitors in North America by, “Karate Illustrated Magazine”. Her success earned her a position with, The Atlantic-Richfield Karate Team and later, the Transworld Oil Karate Team. Throughout her Martial Arts accomplishments, Alice was also a member of the 1986 Canadian National Wushu (Kung fu) Team, taking 3 Silver Medals and ranking 2nd in the overall World Championships. Here are some of Alice's well-earned accomplishments in the many tournaments she has attended in the past several years. In August 2015, Alice received her Godan (5th Degree Black Belt) awarded by Tsukasa Mabuni Soke and the Nippon Karatedo Kai in San Francisco, CA. She was officially given the title of a “Renshi” (Polished Master).